Evening reception at SynBio Beta. The ground floor of the conference hall was filled with people. It was a great night of mingling with other Synthetic Biology enthusiasts. The first day started off with a keynote panel about the revolution in materials and a panel on how we can educate, incubate, and accelerate the next generation of synthetic biologists who will be fueling the bioeconomy. These discussions led to the SynBioBeta Awards in which leaders in public engagement and synthetic biology were recognized for their spirit, passion, and impact within the community. Dr. Christina Agapakis from Ginkgo Bioworks was recognized for her excellence in public engagement. Recognized for their excellence in leadership in Synthetic Biology were Bryan Johnson and Jeffrey Klunzinger, the co-founders of the OS Fund, a venture that invests startups that are working on breakthrough discoveries in genomics, synthetic biology, artificial intelligence, precision automation, and new materials development. Dr. Richard Kitney and Dr. Paul Fremont from SynbiCITE, UK’s national Innovation and Knowledge Centre that promotes the adoption and use of synthetic biology by industry. It was extremely inspiring to learn about these leaders who are trailblazing the way for the advancement of Synthetic Biology. My favourite part of the night was the fireside chat featuring Steve Wozniak and George Church. This was an epic meeting of two giants of technology who were both powerhouses behind innovation that has created so much impact in the world. It was very interesting to see how two people who were different in terms of beliefs, background, and experience came together to find common ground for discussion and connect through discovering similarities. The second and third day were filled with numerous keynote fireside chats, panel discussions, breakout sessions, and training workshops. Some of the highlights from those two days included a keynote fireside chat called “Neuroscience & Synthetic Biology: the Neobiological Revolution”. This workshop was particularly interesting because it presented rising synthetic biology technologies that can potentially treat neurological diseases and even enhance cognitive abilities. During the breakout sessions, I really enjoyed the session on emerging women leaders in synthetic biology. I was elated to see a gender-balanced audience in the room who were interested in addressing the persisting problem of under-representation of women in science and engineering careers. The panelists explored questions such as how do we identify/create/amplify/become champions to encourage more women to pursue leadership within Synthetic Biology and STEM, in general? The lightning talks by companies like Zbiotics, DNA Script, Dupont, Siolta Therapeutics, Indie Bio, and Novozymes offered a panoramic overview of the cutting-edge landscape for synthetic biology. There were many more interesting sessions throughout the second and third day. I enjoyed all of these sessions as they led me to think about issues that I have never considered and open my eyes to the breadth of synthetic biology research happening in the world. After the three-day conference, I was able to reflect on this fantastic experience. As an undergraduate student, I have attended many academic conferences and symposiums. However, this past October was my first time attending a conference like SynBioBeta. This conference was a unique and unforgettable experience as it widened my scope of the impact and potential of synthetic biology. This event was different from academic conferences because research results and data were not the only focus of the conference. Instead of the usual poster and oral presentations, the conference was organized in a way that facilitated knowledge translation in a different sense than just research. The conference presented advances within the industry in addition to interesting research findings within academia. The conference consisted of discussions and fireside chats, which provided interesting insights into the future projection for the industry, education, and social impacts. The engaging environment inspired scientists, entrepreneurs, academics, investors, policymakers, and pioneers to use synthetic biology to build a better future. Walking into the conference, I was a bit anxious because I had no idea what to expect. However, after the conference, I walked away feeling inspired and with a renewed sense of purpose. There were three main takeaways for me after attending SynBioBeta. Firstly, I was blown away by the wide range of topics presented at the conference and learned so much within the few days I was at SynBioBeta. The talks covered various intriguing topics such as Bio Meets Tech, industrial revolution 2.0, the bioeconomy culture, biopharma and health, energy and environment, and food and agriculture. The exposure to numerous diverse synthetic biology ventures within a wide range of sectors illustrated the revolutionary advances happening within the synthetic biology industry. As a past iGEM participant, it was extremely motivational to see how people have transformed their research and proof-of-concept projects into successful companies that are solving real-world problems in the world today. Not only is synthetic biology changing the field of healthcare and pharmaceuticals, but it is also making significant contributions for food, biomaterials and consumer goods. There were even out-of-this-world applications of synthetic biology that are looking into engineering biology for bio-fabrication in extraterrestrial conditions. “I Love GMOs” display from Ginkgo Bioworks. Currently, there is still much skepticism and stigma around synthetic biology. However, I hope that through the continuous efforts of our synthetic biology community that we can openly say that we love GMOs! I think that this movement started by Ginkgo is truly inspirational and is a great trailblazer for making synthetic biology more understandable and approachable to everyone. Secondly, the conference pushed me to be comfortable with feeling uncomfortable. The experience challenged me to make genuine and meaningful connections with other conference attendees by stepping out of my comfort zone. As one of the few undergraduate students who attended the conference, I felt a bit out of place at first. However, after talking to a few people who were now decades ahead into their careers, I realized that they started off very much in the same place I did. I was very excited to hear about their experiences and learn from their insights. Although it may seem intimidating to approach people at first, I found that people were generally very inviting and eager to share their experiences with you. For example, there were many company booths at the conference. Going around from booth to booth, I asked the representatives about their experience working in this industry and how they got to where they are today. These conversations showed me that even as undergraduate students, we have the knowledge to apply for internships within these companies. Many companies eagerly hire undergraduate students as interns and support them in their integration into various project teams. 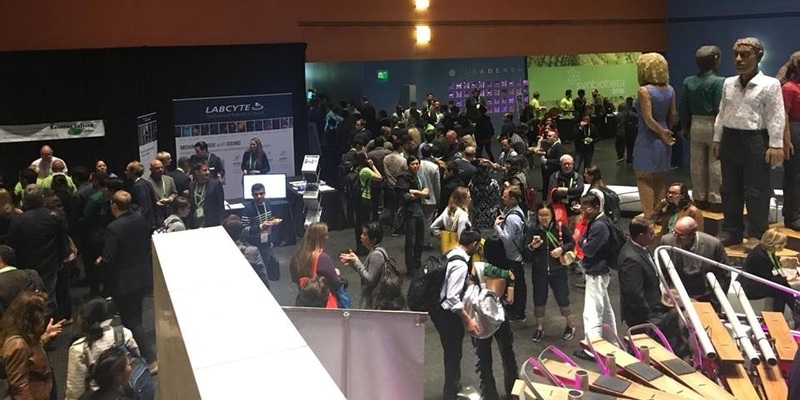 Therefore, if you are a student attendee at SynBioBeta, I would encourage you to be uncomfortable with being outside your comfort zone and to approach people who are working in sectors you are unfamiliar with. Thirdly, this conference has allowed me to see the bigger picture for the future of synthetic biology. Oftentimes, as undergraduate students, we see synthetic biology through an academic lens. If we are doing a summer research project, many of us are focused on the scientific techniques and are less often concerned with social trends that will impact our research. However, the many panels that addressed the impact of trends in science investment, science literacy, consumer preference, biosecurity, and bio-strategies companies shed light on the importance of these factors in propelling a field. The impact that these factors can have are not limited to the industry but are relevant to academics as well. For example, how do we teach science literacy to investors to increase their confidence in their investment? How does consumer preference affect the success of synthetic biology companies? How is biosecurity changing and what are the effects of these legislative changes? What constitutes a successful bio-strategy for companies? Realization of the impacts of these concerns has provided me with a holistic evaluation of the gap that needs to be filled in order for synthetic biology to progress. Having seen so many people who were enthusiastic about synthetic biology at SynBioBeta, I am very excited to see the amazing new advances to come at next year’s conference! Special thanks to John Cumbers for inviting me to attend and present my iGEM Project “Astroplastic: From Colon to Colony” as part of the focus breakout session: Space applications of synthetic biology! This was a truly incredible experience!